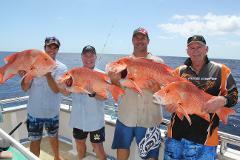 Join one of our scheduled trips on this 4 day and 3 night reef trip. This trip travels out approx 70 nautical miles targeting Red Emperor, Large Mouth Nannygai, Coral Trout, Red Throat, Cod , Spanish Mackerel and much more. 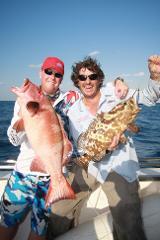 Join one of our scheduled trips on this 4 day reef and shelf explorer trip. 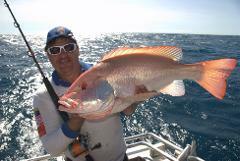 This trip travels out approx 70 nautical miles targeting Red Emperor, Large Mouth Nannygai, Coral Trout, Red Throat, Cod, Spanish Mackerel and much more. Join one of our scheduled trips on this 5 Day reef and shelf explorer. These trips go out to around 70 nautical miles. Join one of our scheduled trips on this 2 day and 2 night reef trip going out approx 50 nautical miles. Join one of our scheduled trips on this 6 Day reef and shelf explorer. These trips go out to around 70 nautical miles.